I was at the bookstore on the weekend and went over to the 'd' section to see if Tom De Haven had written anything new. 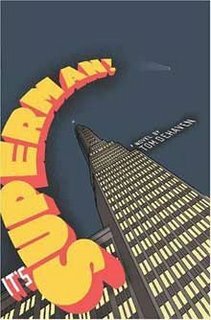 Low and behold, he has gone and written a book on Superman! For those of you not familiar with De Haven's work he wrote a terrific trilogy that revolved around the evolution of the comics. The second book fast forwards to the nineteen thirties with 'Derby Dugan's Depression Funnies'. 'Pinfold and Fuzzy' have been transformed into Derby Dugan and the story revolves around the life of the comic's ghost writer. This book features one of the great curmudgeon characters of all time, Walter Geebus. 'Dugan Under Ground' is the third book and takes us to the modern day. Derby Dugan as it was known is no longer. However, it is being kept alive in subversive form by Roy Looby, a contemporary of the likes of Crumb. One of De Haven's talents is the superior ability to conjure up the feeling and atmosphere of these time periods. He also seems to just roll along through the story, spending his time examining his characters. These books are not page turners, they settle in and move at a leisurely pace. Then, as it all starts to culminate to the finish, he hits you with some profound ideas and emotions. The trade paperback of 'It's Superman' is out at the end of the month and I'll be picking it up for sure.